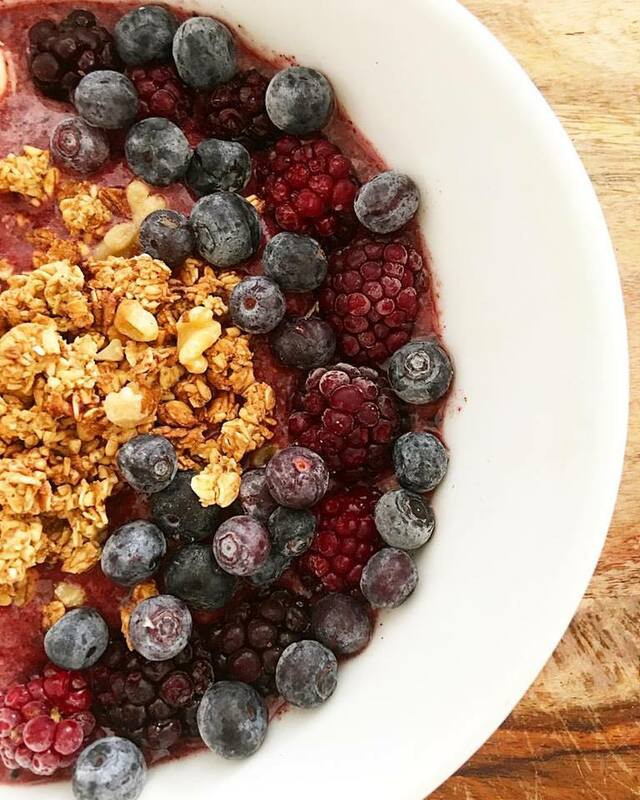 Blend all ingredients in a food processor. Pour into bowl and top with 1/4 cup Frozen Blueberries, 1/4 cup Blackberries, Banana Slices, 1/2 cup Oil Free Granola and drizzle with 1 tbsp of Honey! You can whip this recipe up in a minute with almost zero clean up! It's fast nutrition that feeds your body and mind! Yum! 1. Parsley: Reduced disk for cancer, helps control diabetes, and reduces inflammation and pain associated with rheumatoid arthritis, along with helping prevent osteoporosis. It also acts as a pain reliever with anti-inflammatory properties. It can provide relief from gastrointestinal issues such as indigestion, stomach cramps, bloating, and nausea, while helping to strengthen the immune system. 2. Beets: Beets help lower blood pressure which comes from the naturally occurring nitrates in beets, which are converted into nitric oxide in your body. Nitric oxide, in turn, helps to relax and dilate your blood vessels, improving blood flow and lowering blood pressure. Beets are a unique source of betaine, a nutrient that helps protects cells, proteins, and enzymes from environmental stress. It's also known to help fight inflammation, protect internal organs, improve vascular risk factors, enhance performance, and likely help prevent numerous chronic diseases. They also help the body detox! 3. Avocado: Recent studies have shown the addition of avocado to an already well-balanced diet lowers the risk of heart disease, improves blood levels of LDL, and lowers levels of oxidative stress in the bloodstream following consumption of food. They also help the body have a higher absorption rate of carotenoids which are pigments that help protect the body from diseases. To boost your immunity and improve your general overall health this is a great salad to add to your diet & it's delicious! Add a dash of nutmeg and vanilla to spice up this latte even more and Enjoy! A potent anti-inflammatory spice, which protects against oxidative stress. Research has suggested that turmeric and its anti-oxidative ingredient, curcumin, can help reduce inflammation, help heal wounds, relieve pain, contribute to weight loss, prevent cancer and long term use has been known to change the bodies composition to continually reduce inflammation and improve cellular health. Contains large amounts of highly potent polyphenol antioxidants which protect the body from oxidative damage caused by free radicals. The antioxidants in cinnamon have anti-inflammatory effects, which may also help lower the risk of disease. Cinnamon also has been known to suppress the appetite and can be used as an alternative to sugar and sweeteners. Combining Honey, Turmeric and Cinnamon creates a powerful anti inflammatory compound. This compound has been known to reduce inflammation, swelling, pain, rheumatoid arthritis, gastric inflammation, improve circulation and is also a good tool for cancer prevention as it lowers oxidative stress from free radicals. This should be a staple in your morning routine and you will feel the benefits within one week of daily consumption. 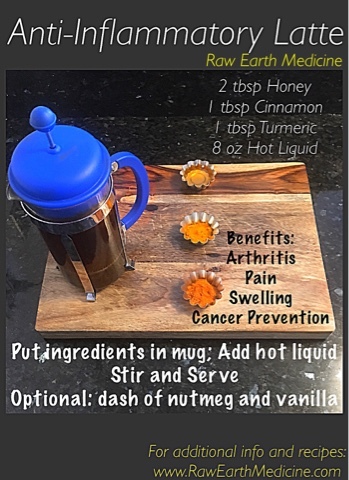 Watch how you no longer need anti-inflammatory pharmaceuticals after you switch to this Latte!